Two Championship footballers have been arrested after a fan was allegedly assaulted, police have said. 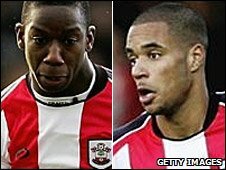 Southampton FC strikers Bradley Wright-Phillips, 23, and David McGoldrick, 21, are accused of assault and affray. A 21-year-old Saints fan told police that he was attacked by the two footballers in a Southampton street as he made his way home from a night out. The incident is alleged to have happened on Saturday, 7 February after players went drinking in the city. It followed the cancellation of a match against Watford due to bad weather. In a statement on the club's website, Saints coach Mark Wotte said: "I am aware of the allegations that have been made against my players. "I have spoken to them both at length where they have explained to me what happened that night and I will support them 100%. "We are unable to comment any further at this time as the matter is under police investigation. "However, I can assure our fans that everyone at the club remains focused on the remainder of the season." A Hampshire Police spokeswoman said: "Hampshire Constabulary can confirm it has launched an investigation following an allegation of assault between 0200 and 0215 GMT on February 7. "A 23-year-old man and a 21-year-old man have been arrested on suspicion of affray and common assault and released on bail pending further inquiries." Mr Wright-Phillips is the half-brother of Manchester City's Shaun and son of former England and Arsenal player Ian Wright.